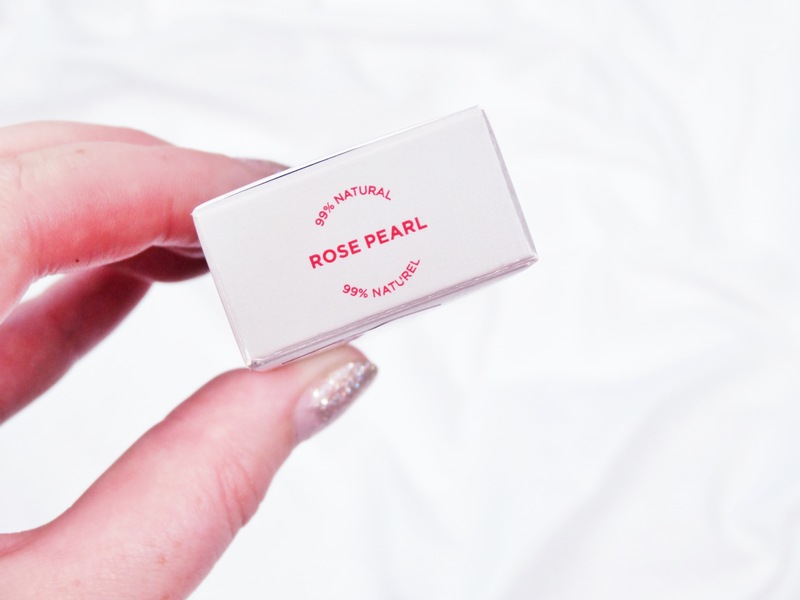 When I waked into Sephora during the spring this year, Bite Beauty‘s Prismatic Pearl Creme Lip Glosses caught my eye within seconds. I remember the moment precisely, It was mid-April and the collection was at the end of an aisle being highlighted as a must-have product. I applied the rose pearl shade on my lips in Sephora, I placed it over a matte lippie. 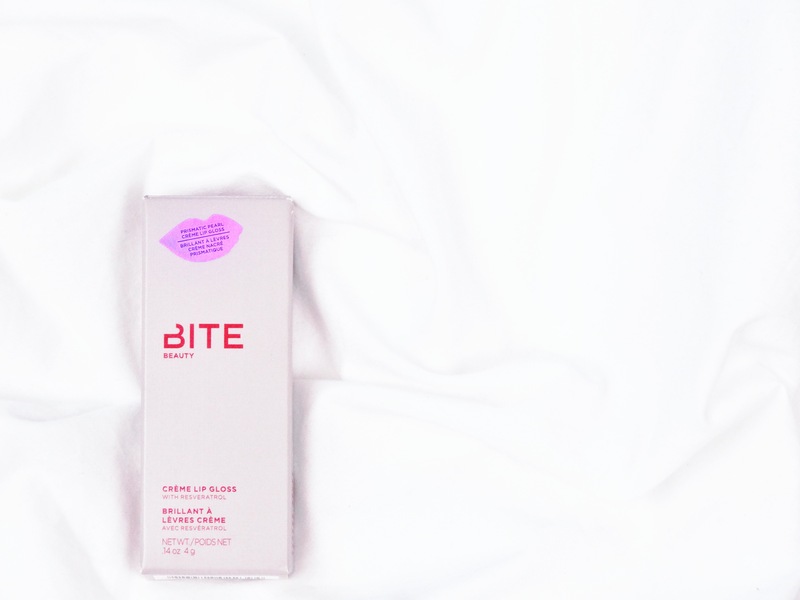 The product transformed the lipstick look ten-fold and at that moment Bite Beauty had captured my heart! The duo chrome sparkles of the prismatic pearls caught my immediate attention. Upon application, it really is mesmerizing. 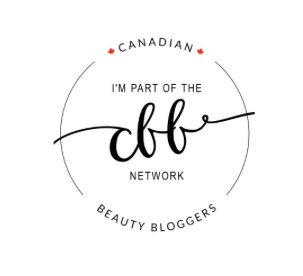 It is also made in Canada and is made of 99% natural ingredients. It will transform any makeup look from dull to sparkling in 60 seconds without fail. Duo chrome means that when the light hits the product you can see flecks of a different shade running through the product. So naturally, anything that is duo chrome, is more eye-catching. The primary colour is red and pink and the shift being more gold. Upon swatch and application to the lips, I don’t see much of a duo chrome finish but looking at the product in the bottle it is very evident there is a shift of gold with the product. 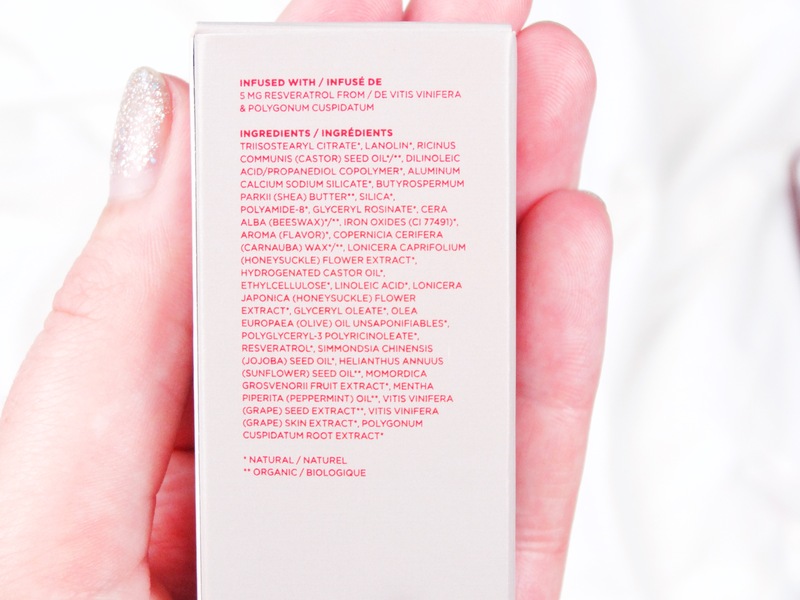 How mesmerizing does the product look in its packaging! The product comes with a doe foot applicator and is easy to work with. The product glides onto the lips very easily and its easy to line the lips using this type of applicator. The product is advertised to be 99% natural and some ingredients are marked as organic. When I initially saw this product in Sephora, this particular shade was out of stock. 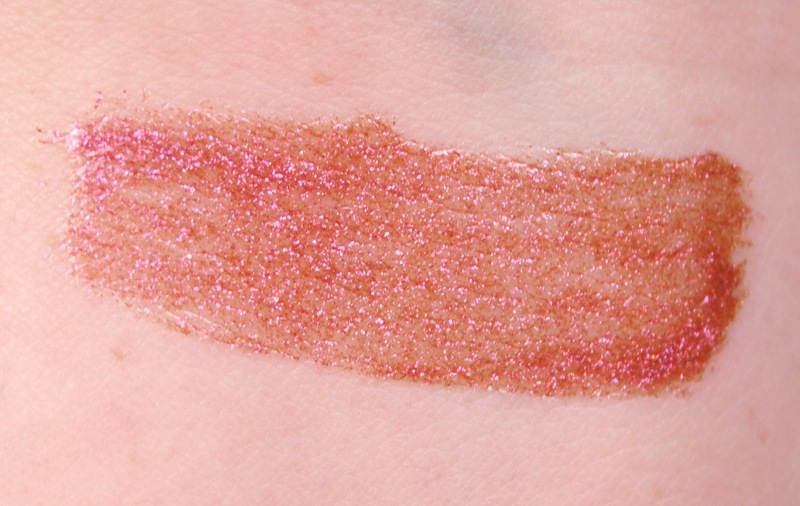 While I was waiting patiently for the product to be put back on the shelves, I thought that maybe I could recreate the product using some lip gloss and a sparkley pigment. I tried a few times to replicate the product but everything I tried turned into pure colour with no sparkle. Eventually the product came back into stock and I purchased it. There’s no alternative to a product like this! 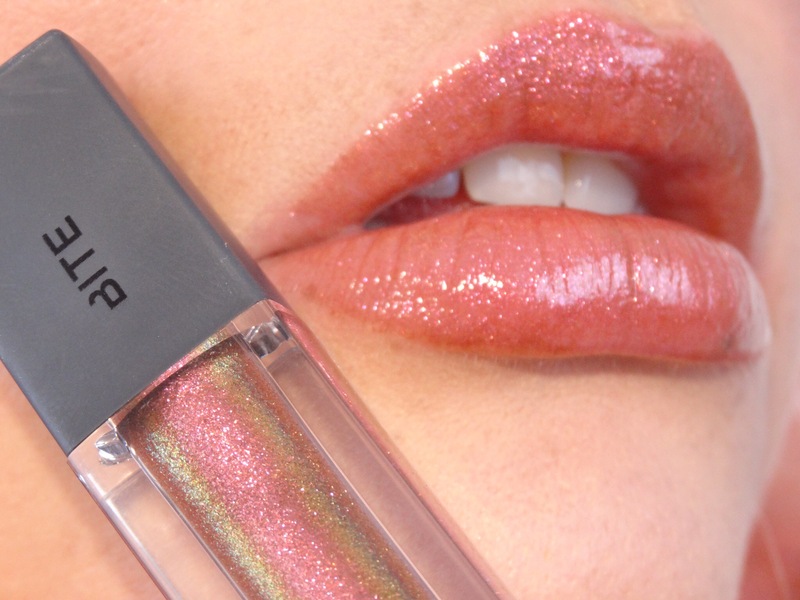 The second you apply the gloss to the lips it is extremely sparkley. Amazingly sparkley! It has a very strong pink/red sparkle. When worn on bare lips, there is a light pink colour to the gloss, and it is buildable if you want to add more colour you can. After about 30minutes the sparkle dies down unfortunately. However you are still left with some sparkle and a nice pink colour on the lips. 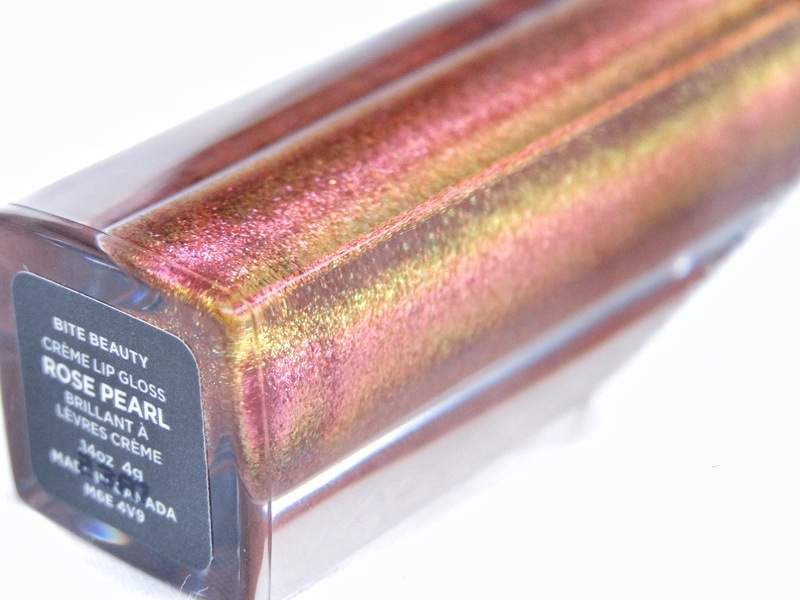 When you wear the gloss over a lipstick, I find the sparkle dies a little quicker. It’s like the sparkle flecks sink into the lipstick. The gloss itself is quite thick in consistency. I guess this is because it has to be thick enough to carry the glitter flecks. It is very comfortable on the lips, very slightly tacky but not at all goopy. I found that If I applied too much (..cos sometimes you just can’t stop y’know? ), it felt like the product was seeping into my mouth at the corners. So don’t overdo it folks! What does this product smell of? It is very difficult for me to pin point accurately the scent.. so here I go! The initial scent of the product is light, lemon, sweet citrus. Then I feel like there is a chocolatey, buttery almost minty undertone scent/taste.. It smells and tastes good, that’s all I know for sure! Unfortunately for me, it coats and irritates the back of my throat ever so slightly. This does occur to me with many lipsticks, even MAC. I’m a little sensitive to scents! The product is a gloss so it’s not going to last all day and will need to be reapplied periodically. I found, because of the thicker consistency, it lasted a good three hours before noticing there was little shine left and product was worn away on the inside of the lip. Saying that, you’d still get away with another hours wear without topping up because there are glitter sparkles left over on the lip to keep the shine going for another little bit. 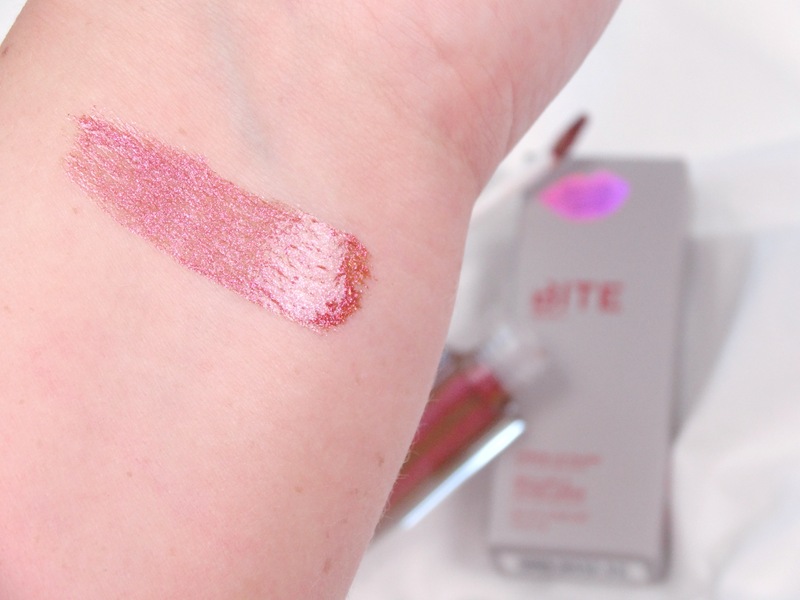 The Bite Beauty’s Prismatic Pearl Creme Lip Glosses come in seven different shades and retail for CAD$25 in Sephora. 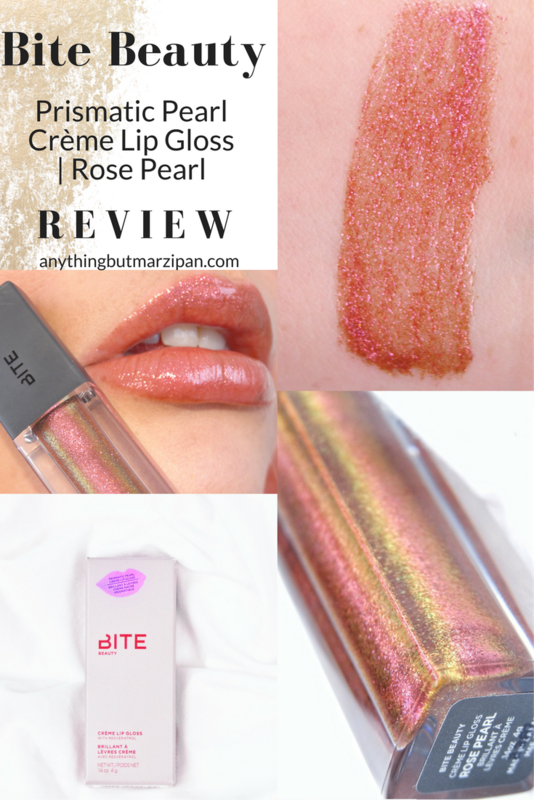 I hope you enjoyed this review.. Have you tired any of the Prismatic Pearl Creme Lip Glosses? Let me know what you think, lets get the conversation started!